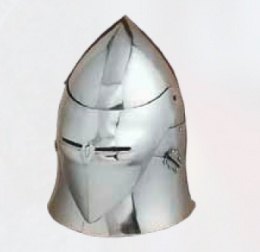 A sugar loaf helmet is a variant that blends great helm and bassinet, that features tall peak, as opposed to a flattened top. This tall peak helps to divert force down the sides of the helmet, rendering downward blows and falling arrows less effective. This helmet also features a secondary feature though, in the form of a working visor that possesses narrow eyelets. When not in battle, this visor can be lifted up, revealing the armored warrior's face, providing a wider field of vision and a greater level of airflow. This page was last modified on 18 May 2014, at 21:48.